Hagg Lake is already a summertime water source for Hillsboro residents. Winter water comes directly from the Tualatin River. For ten years, Hillsboro and its partners have explored expanding the size of Hagg Lake to meet our future needs. Recent seismic issues have arisen that have significantly raised project costs. 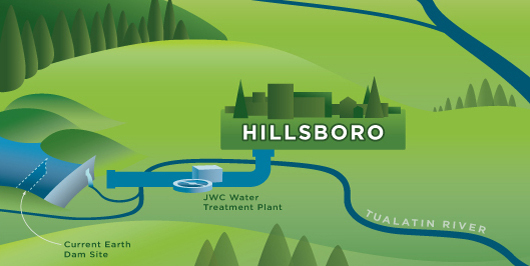 The Tualatin Basin Water Supply Project (TBWSP) involves the cities of Beaverton and Hillsboro, the Tualatin Valley Water District, and Clean Water Services. Together, these entities would either build a new dam directly below the current Scoggins dam, or raise the existing Scoggins dam, to increase the capacity of Hagg Lake and meet federal seismic standards. A pipeline would be built from the dam to the Joint Water Commission (JWC) Water Treatment Plant (WTP) so that water could be pumped from the Tualatin River to Hagg Lake for wintertime storage. Then, during the summer months, the stored water would be gravity-fed from the lake to the JWC WTP to supply drinking water for Washington County. As part of this project, the JWC WTP would have to be expanded to supply the additional water. The Tualatin Basin Water Supply Partners (Beaverton, Hillsboro, Tualatin Valley Water District, and Clean Water Services) have been researching this option for ten years. This was the original preferred option for Washington County’s long term water supply. Over this ten year process, the Partners have initiated a Comprehensive Environmental Process to begin mitigation negotiations with the various state and federal agencies which would be involved in a dam raise or new dam construction. The partners are also working on the design of a potentially new intake to insure the feasibility of the pipeline portion of this project. Originally, this project envisioned that the federal government (Bureau of Reclamation), who is the current owner of the dam, would transfer ownership (title) of the dam and its facilities to a newly-formed local entity, who would then build, maintain, and operate the new/raised dam. The new entity would include the Partners, mentioned above, plus Forest Grove, Tualatin Valley Irrigation District, and Washington County. A draft Intergovernmental Agreement forming this new entity has been negotiated, but has yet to be signed until the parties learn more about the cost and feasibility of this project. In 2007, the Bureau of Reclamation (BOR) conducted a seismic analysis of the existing Scoggins dam and found that the existing dam may be vulnerable in a large scale earthquake. At that point, the expansion Partners hired a firm of dam safety experts to assess whether a new dam or dam raise could be built that could withstand the kind of earthquake the BOR’s analysis contemplated. The results of that study concluded that a raise or new dam could be built but at a significantly higher cost than was originally contemplated. The BOR conducted a corrective action study within their Safety of Dams Program. The study analyzed the feasibility of replacing or retrofitting the current dam to meet seismic standards, and the costs associated with the identified alternatives. Citizens in Washington County have been drinking and using Tualatin River and Hagg Lake water for decades as their main source of water. This project would not change the source of water being consumed today and while treatment techniques may be expanded, the drinking water will continue to be of high quality. The project has four major components: construction of a new dam or dam raise; doubling the capacity of the JWC WTP; a seven-mile pipeline to pump Tualatin River water into Hagg Lake during winter months, and mitigation to compensate for a larger reservoir and the environmental impacts that the project would create. The JWC WTP is a conventional drinking water treatment plant, the largest of its kind in the state of Oregon. If the Hagg Lake Expansion option is chosen, the JWC WTP will have to further expand its daily treatment capacity in order to meet the needs of the region. The JWC is also conducting a pilot study to assess whether to install ozone as an additional disinfection process. This option includes an expansion of Scoggins Dam to store up to an additional 60,000 acre feet of source water in Hagg Lake. Treated water would continue to be stored at the JWC Fern Hill Facility and throughout the system in agency-owned reservoirs. Some of the water would also be injected and stored in aquifers during the winter. The water would then be recovered and used during the summer. A draft Environmental Impact Statement (EIS) was begun for the original plan of raising the existing dam by either 25 or 40 feet. However, because new seismic standards will likely require an updated facility design, additional environmental impacts from alternative designs will need to be considered before the EIS can be completed. The project Partners have applied for a Water Right from the Oregon Water Resources Department to store an additional 60,000 acre feet of water at Hagg Lake. The Partners are also assessing how much water would be available from the Tualatin River in the wintertime to be pumped into Hagg Lake. The Water Right application is currently on administrative hold until the Seismic Corrective Action Study is completed and the project partners determine the expansion feasibility. Some property impacts would result from an expansion at Hagg Lake. Project managers are currently working with existing landowners around the lake on property acquisition and are keeping them updated on the project impacts and the project schedule. The project partners have initiated a comprehensive Environmental Process to analyze and identify all permitting processes and required mitigation for this option. All proper permits for the project will be obtained if the project moves forward. If the dam is expanded, will recreational activities still be allowed on Hagg Lake? Yes, the lake is a recreational area as well as a drinking water source and there are no plans to change that fact. Will a larger lake fill to capacity every year? Not without extra help. Part of this project includes a "raw water pipeline" and the potential for "pump-back." This would allow the partners to pump Tualatin River water back into Hagg Lake for winter storage and increase the reliability of it filling to capacity every year. Will the dam and impound still be owned by Bureau of Reclamation and operated by the Tualatin Valley Irrigation District? Project partners have explored the possibility of transferring ownership title from the Bureau of Reclamation to the Partners to ensure more local control over an expansion project and regular day-to-day operations. However, all transfer proceedings are on hold until the cost of retrofitting or replacing the existing dam for seismic issues is determined.